🎥 Please do press the blue link SFB MEETUP "SEE ALL" ☀☀☀☀☀. :) :). 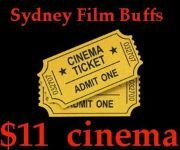 🎥 So why over-pay WITH ONLINE TICKETS when you can pay just $11 PER MOVIE with SYDNEY FILM BUFFS 🎥 Only If you love your movie films, you are in very good company 🎥 We are fanatical about new release cinema films - - - and of course you are too, including BOOK TO MOVIE FILM ADAPTATIONS ☀☀☀☀☀. :) :). This meetup movie group also recommends "Theatre Time Sydney"
Could you please remember to go to the SFB website to immediately press the "You're going RSVP: Yes" to change it from YES to NO, by unticking and/or pressing the X button - - - when you are no longer able to attend our SFB meetup movie event. Thank You. Please remember that, SYDNEY FILM BUFFS occasionally from time to time, do also have cheap $11 discount cinema ticket vouchers for each cinema event, and are only available in "very limited quantities" that you can purchase from the event host (organiser) at each screening event, when you arrive early, just for our members to use only at our meetup movie events. PLUS only for those members who have attended three or more SYDNEY FILM BUFFS fully paid events during the last twelve months - (yes T&C apply) - sometimes free entry tickets to brand new releases, as well as sometimes free entry tickets to sneak preview advance-screening events too. "VERY LIMITED QUANTITIES" means that seven days before each advertised screening event date, SYDNEY FILM BUFFS pre-purchases exactly 100% of the $11 discount cinema ticket vouchers needed for that event, and always based solely on the TOTAL NUMBER of genuine YES RSVPs already received seven days before the event. Of course "VERY LIMITED QUANTITIES" means that we NEVER EVER GUARANTEE to have available, any additional $11 discount cinema ticket vouchers, for everyone who decide to YES-RSVP during the six days before each advertised screening date . . . . . . . . . So if you love movie films, love Cultural Cinema, love World Art-House Independent Cinema + Foreign Cinema (sub-titled) + Indie Film and/or love Mainstream Hollywood + Australian Cinema in Sydney, plus Premium Special Event Cinema Screenings, plus OPENING NIGHT Screenings, plus Q&A Screenings, AND you would love to join like minded people, then this cinema meetup group is the perfect choice for you. Here is the place for movie lovers to share their love of watching movies PLUS afterwards you can choose to discus the shared experience. Meet new people and enjoy seeing interesting, entertaining or thought provoking movies together. Sydney Film Buffs movie choices are artistically curated by our accredited FCCA film critic, who is tasked to watch and review 300+ brand new movies every year. We are not film snobs in this group – We are a very friendly and un-cliquey bunch – Just so you know, at any given event usually about a quarter of meetup attendees have never been to any previous event, and have not yet met anyone in the group – and of the others most have only met one or two people who are there. So do not worry about about not knowing anyone at your first event. PLEASE REMEMBER that the Australian Film Censorship Board (OFLC) takes up to eight weeks to classify each new movie submitted for classification, before these new release movies are available for Australian Citizens to watch in any Australian Cinema. "Every time that you arrive late, you are saying that your time is more important than the people who have been waiting for you." There is a one-off administrative fee of $5 cash, to try to cover 2018-2019 meetup group costs, and this is to be paid at the first event that you attend. Entirely out of respect for everyone else who YES RSVP early and ARRIVE early, do you understand that when you NO-SHOW for any 2018-2019 event without changing your RSVP-YES to RSVP-NO, then you will be removed from the group ? . . .
N.B. Entirely out of respect for everyone else who YES RSVP early and ARRIVE early, when you discover that you are NOT ARRIVING EARLY, please do remember that your event host chooses to never ever wait for latecomers. FULL PRICE Advance Purchase Tickets are NOT YET available for purchase at the cinema and are NOT YET available for purchase online, but FULL PRICE TICKETS will go on sale one day before the Thursday release day (i.e. the Wednesday) . . . however YES you can get to see this movie for only $11.00 - when you read the full set of instructions, that are located on this event page. From time to time SYDNEY FILM BUFFS also often have cheap $11 cinema ticket vouchers for each cinema, available for purchase from the event host, just for our members to use only at our meetup events. Very limited quantity of $11.00 movie ticket vouchers are available to purchase from the event host, when you YES RSVP early and ARRIVE early (ten minutes), so who wants to arrive late and pay full price ? Please note that your event host, only has a few cinema discount $11 ticket vouchers available for this movie, so arrive early to choose your perfect seat. "Late arrivers" will miss out AND also have to pay full price, OR you may find that the cinema session is already completely FULL . . .
To get the members only, cheap $11 cinema ticket vouchers, all intending guests of members, should join and then YES RSVP as a member. Please meet your event host inside the cinema lobby near the inside box office at least 20-30 minutes before the film start time, to purchase your $11 voucher, that you can then exchange for a ticket. Please remember this film is opening today (Thursday Night), so it may well be popular, and SYDNEY FILM BUFFS can only provide cinema discount ticket vouchers for everyone, who gets there early i.e. before the cinema session is FULL . . . Please note that your event host, only has twenty cinema discount $11 ticket vouchers available for this movie, so arrive early to choose your perfect seat. "Late arrivers" will miss out and also have to pay full price, OR you may find that the cinema session is already completely FULL . . . For each and every session time, i.e every 150 minutes . . . the cinema box office staff try to sell all 998 seats for its ten cinemas, so ARRIVE EARLY and beat the other 998 people in the box-office-queue . . .
. . . OPENING NIGHT . . . Join us for this much anticipated movie. TBA - Only when the cinemas have finally decided to release their time schedules, the event page will be updated with the accurate time and location. Please meet the event host inside the lobby near the inside box office 20 minutes before the 6:30pm film start time, to purchase your $11 voucher, that you can then exchange for a ticket. The event host is always very easy to find, because that person will be wearing a white name tag with their name in large print, and the event host is always located in the cinema lobby near the inside box office and will wait for you during the 20 minutes before the 6:30pm film start time. NOW UPDATED - The cinemas have finally decided to release their time schedules, and the event page has now been updated with the accurate time and location. Please meet the event host inside the lobby near the inside box office 20 minutes before the 6:30pm film start time, to purchase your $11 voucher, that you can then exchange for a ticket. The event host is always very easy to find, because that person will be wearing a white name tag with their name in large print, and the event host is always located in the cinema lobby near the inside box office and will wait for you until the 6:30pm film start time. Any comments and any questions please leave a message below OR if on the day of the event text me on 0417171450 . . . Maggy . . .
choose one movie - we are offering two movies on this night - so our members can choose to go to see either movie . . . YES both movies are recommended . . . EITHER/OR . . . it is your personal choice on the night to GO TO THE MOVIE that you want to see . . .
2019 There is a one-off administrative fee of $5 cash, to try to cover the 2018 meetup group costs, and this is to be paid at the first SFB movie event that you attend. 2019 There is a one-off administrative fee of $5 cash, to try to cover the 2018-2019 meetup group costs, and this is to be paid at the first 2018-2019 event that you attend. 2019 . . . N.B. Entirely out of respect for everyone else who YES RSVP early and ARRIVE early, do you understand that when you NO-SHOW for any 2018 event without changing your RSVP-YES to RSVP-NO, then you will be removed from the group ? . . .
2019 N.B. Entirely out of respect for everyone else who YES RSVP early and ARRIVE early, when you discover that you are NOT ARRIVING EARLY, please do remember that your event host chooses to never ever wait for latecomers. TBA - When the cinema releases its schedule I will update this page with the correct time. November 2018 DENDY CLUB Members on Mondays pay half price all day and night, and DENDY CLUB Members can bring as many guests as they like at the very cheap DENDY CLUB Members pricing of just $8.00 for each ticket, so very very cheap tickets are avalable on Mondays. - - - Please meet me inside the foyer 20 minutes before the movie starts, so we can buy our cheap tickets together and perhaps sit together. Please only RSVP YES if you are ACTUALLY coming to see this movie. TBA - Monday day date 2019. When the cinema has released its weekly schedule, I will update this page with the correct time. Actual time to be confirmed, and at DENDY NEWTOWN the movie probably starts at 6:30pm. Please meet Kingsley and myself, inside the box office foyer of the cinema, at least 20 minutes before the move starts, so that we can purchase cheap tickets. Any comments or questions please leave a message below, or if on the day text me on 0417171450. SYDNEY FILM BUFFS acknowledges the traditional Aboriginal and Torres Strait Islander owners of country, throughout Australia and pays our respects to them, their culture and their Elders past, present and future. E.&O.E. Yes our organizers strive for accuracy, but as humans, we do on occasion make mistakes. So we can keep this group as enjoyable as possible for everyone there are few conditions we would like our members to be aware of. Most people will find these conditions to be common sense. If any of these conditions seem unfair to you, or you do not agree with them, then Sydney Film Buffs may not be the correct group for you. Number of people at Events and attendance. Firstly, you must be 100% committed to attend any meetup event that you have registered to, regardless of the weather conditions. If the weather is considered extreme by the organiser, he or she will change or cancel the event. If you RSVP YES for a meetup event and you cannot attend, please immediately change your RSVP. It is your responsibility to manage your RSVP and your RSVP wait lists. If you are in a position where you often change your RSVP YES to "not going", please do not RSVP YES until you are 100% committed to attend. We always monitor all RSVP and all RSVP changes, because often we do have wait lists due to the popularity of our meetup events. Hence we may need to remove those repeat offenders from group or particular events. We limit the numbers of participants at some of our meetup events due to logistical issues, in order to better enjoy a particular meetup or in more remote places for safety concerns. An important note: Guests are bound by the same terms and conditions as members, and it is the member's responsibility to provide the full terms and conditions to any guests included on their RSVP YES. Our activities are recreational and casual. All participants and their guests by choosing to RSVP YES to any event are agreeing to take full responsibility and liability for their own safety and health at all times during the meetup event. Attendees will at no time hold the organiser and/or leader/event host responsible for any accident, misadventure or ill health that may occur whilst attending an event including damage to or loss of equipment/belongings. Children are not permitted to attend meetups unless specified and at the permission of the event host or leader. Each child must be monitored 100% of the time by the parent or parents. Attendees who RSVP YES for an event agree that it is their responsibility to ensure they are fit enough to attend the event and to ensure they have sufficiently researched the activity, and the prevailing weather conditions and warnings in order to make an informed decision whether or not the event is suitable for them. Important note: This meetup group, its organisers and leaders accept no liability during this meetup event. Leaders will try to ensure the safety and well-being of members at all times, however, accidents may happen. Please take responsibility for your own safety and your belongings. Our meetups start on time. In most cases we cannot wait for you if you are running late, as this sets back our schedule and also keeps a large group waiting, which is unfair to the majority that turn up on time. Please always give yourself plenty of extra travel time, to allow for the expected Sydney traffic delays and Sydney public transport delays, plus for the extra travel time taken to walk to the venue meeting point. There is a one-off administrative fee of $5 cash, to try to cover 2018-2019 organizer meetup group annual fee costs, and this is to be paid at the first SFB event that you attend. Some paid meetup events will incur other fees, and those fees will always be clearly indicated. Please check each meetup events thoroughly before you RSVP YES. Most of those paid meetup events are non-refundable, so please make sure you are 100% committed to attend to avoid disappointment. In most cases, you will be responsible to buy your own ticket in the case of cinema movies, concerts, fund-raisers or such similar events. Important: Most cafes/restaurants do not allow to split the bill, hence you need to always bring CASH and including LOOSE CHANGE - GOLD COINS to pay for your food/drinks OR your part when we share the food. The main purpose or topic of this group is to have fun. Put simply, do activities that makes you laugh and have a good time. This meetup group is not a single-mingle dating group. Some members are, for good reasons, quite annoyed by coming to activities on this group and being picked-up for dating. It is highly recommended that you find another meetup group that is tailored for that specific purpose, where you would be more welcomed and that the members would be in a state of mind, where they are ready to deal with that dating kind of expected behavior. Please remember that our organisers put in a lot of time and effort, to make this meetup group as enjoyable and rewarding as possible. If you are unhappy with something, or wish to make a comment on how the group is run, please respect the organisers by communicating with them directly, and not openly in the open forum. This gives them an opportunity to assist you. If there is a problem whilst on a meetup event, please contact the leader as soon as possible rather than discuss with other members. The links to other websites, content or resources contained herein are operated by third parties, and we have no responsibility or control over them. Terms and conditions and penalties apply for the provision of services by third party service providers. We do our best to verify the information provided to us by third parties, but we cannot guarantee its accuracy. You understand and agree that we cannot be held responsible for errors or omissions caused by incorrect or inadequate information supplied to us by such third parties. You agree to make your own enquiries to verify information provided, and to assess the suitability of products before you purchase. Sydney Activity & Adventure Group - Top 10 Meetup in Aus!